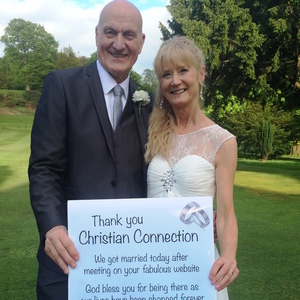 I got married to Julie in a beautiful ceremony at Kilburn Hall in Derbyshire and it was the perfect day. Thank you so much for being there to connect us. Julie could have been anywhere in England but because God was in this she ended up living 20 minutes from me. We met 18 months ago and chose not to live together until we were married. Our lives have been transformed forever because of you. I have played basketball for England including the Commonwealth games, have played professionally and still hold the British record for the most points scored in a single match but yesterday topped everything I have ever achieved in sport or business. I am 61 and never thought that I would meet the woman of my dreams but I gave up and let God choose for me. The future is now so rosy and I can't wait for what God has in plan for us. Already two or three people have asked for your details after they heard how we met.